Crystal glass nail files for wholesalers and retailers. Wholesale crystal glass nail files, tweezers, pocket mirrors hand decorated with Swarovski crystals. Mont Bleu produces crystal glass nail files and decorates variety of high quality products. 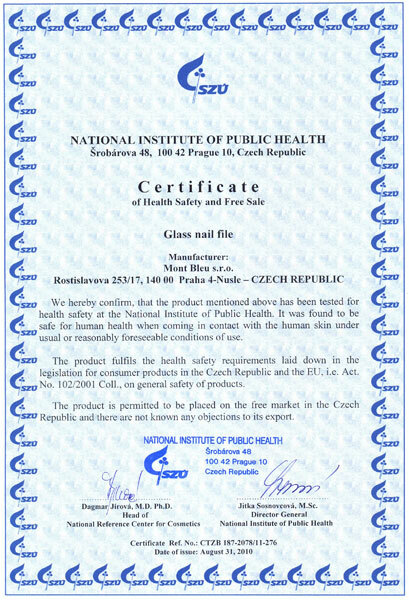 Certificate of Health Safety and Free Sale issued by National Institute of Public Health, which status is confimed by The Ministry of Health of Czech Republic. What it says: the files we make safe for your health and we can sell them. 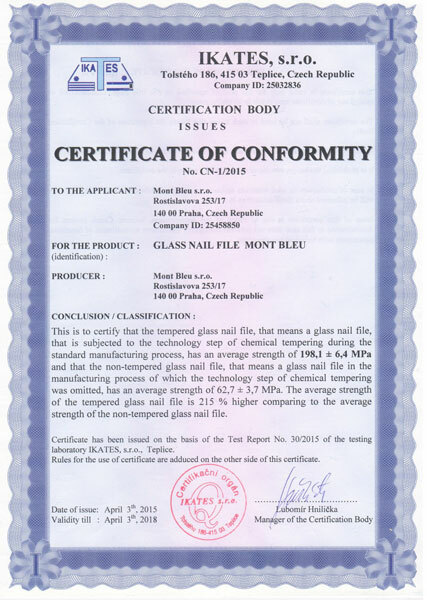 Certificate of Conformity issued by IKATES testing laboratory, a certification body in Czech Republic. What it says: our files are extremly durable. When tempered, we temper them twice, they have 198 MPa strenght. While our competion has only aroun 120 MPa, I will not mention Asian ones, they are not tempred at all. Sedex. We are part of Sedex responsible supply chain. What it means: we follow responsible rules. For example: we value our workers, they have good conditions. 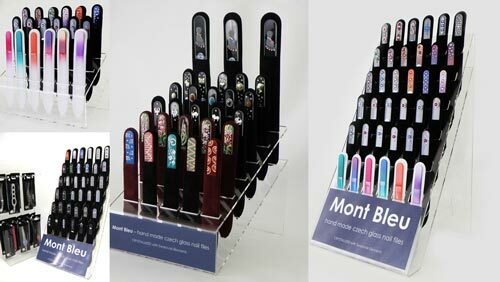 Mont Bleu – is a manufacturer of Czech made crystal glass nail files and a design atelier. We offer quality products for all niche markets. You get merchandise directly from mass and exclusive products producer. We use only genuine crystals from a well known producer Swarovski. • Who we work with? Our products are available on all five continents. We already ship our products to these countries: USA, UK, Japan, Poland, Latvia, Mexico, Lithuania, Estonia, United Kingdom, Australia, New Zealand, Russia, South Africa, Czech Republic, Argentina, Columbia, Venezuela, Kazakhstan, Singapore, Uzbekistan, Armenia, Ukraine, Germany, France and Canada and many more to come. We do not work directly with everyone, our partners and local distributors help us. • How we work and who we prefer to work with? We prefer close and long term cooperation. We are ready for new cooperation proposals; please do not hesitate to contact us! We look for companies, resellers, wholesalers, retailers, distributors that work in following sectors: Cosmetic, Beauty, Perfumery, Pharmacy, Fashion, Accessories, Gifts, Souvenirs, Bijouterie, Advertising and Corporate Gifts. To find out if there is a distributor in your area or to become one, please do not hesitate to contact us.